(Background and Aim) Esophagectomy and esophagogastrectomy are major operations with high mortality and morbidity, for which anastmotic leakage of esophageal substitute is a serious and potentially fatal complication. Five patients who had postoperative endoscopy after esophagectomy were investigated. (Patient and Methods) The median age was 67 years (range 59 to 75). All patients underwent transthoracic esophagectomy with a gastric tube reconstruction for thoracic esophageal cancer. Anastomoses were all performed with end-to-side fashion using a circular stapling device. The gastric tube was pulled up through the retrosternal route in four patients and through the posterior mediastinal route in another patient. 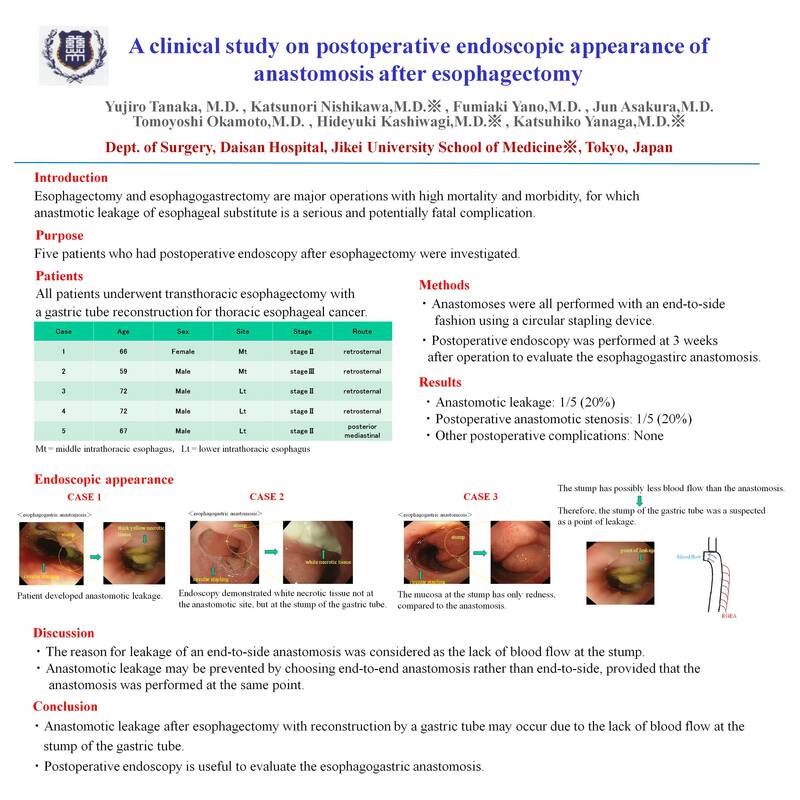 Postoperative endoscopy was performed around 2 weeks after operation to evaluate the esophagogastric anastmosis. (Results) One patient developed anastomotic leakage. Postoperative endoscopy demonstrated thick yellow necrotic tissue, not only in the anastmotic site but also at the stump of the gastric tube which was a suspected to be the point of leakage. In other cases, small necrotic tissue was identified, while the anastmosis remained intact. (Discussion) The reason for anastomotic leakage in this study was considered as the poor blood flow at the stump. We might prevent anastomotic leakage by choosing end-to-side anastomosis, provided that the anastomosis was performed at the same level.